Members attending participated in a brief round-up by Jeff of last years' exciting news items culminating in the move to Fallowfield. This was followed by a delicious supper prepared and served by Eylem and a duplicate from 7.30pm. Jeff's Review of 2018 Activities, Successes and Results are now under the yellow tab top left of this page marked "2019 AGM"
With great sadness we must inform members that Michael Clarke died on 17th April. He was primarily a rubber bridge player but had been a member of the Agamemnon league team for many years, playing with Martin Braid until Martin's death then with Jeff Morris. The team always placed well in the league, winning in 2007 and finishing second this year. Michael was also on the Goldstone Trophy winning team in 2007 and won the Gazette Trophy a couple of times on Manchester Bridge Club teams. In 1982 he won the National Masters Pairs with Jeremy Wyndham. Our condolences go to his wife and family. The Teltscher Trophy - the 'senior Camrose' competition - took place this weekend. This year the event was held in Edinburgh, Scotland. 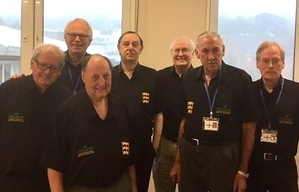 The England team (pictured from left to right: Norman Selway, Gunnar Hallberg, Paul Hackett, Brian Senior, John Holland, David Mossop and NPC Simon Cochemé) were victorious, winning all 10 matches on the way to the trophy. Last year's champions Scotland were runners up. Nearly half the field were Manchester players at Preston on 14th April. Best Manchester result was achieved by John Holland with Jackie Pye who were second. Jeff Morris and John Hassett were third. Results are on the Preston site. The 2019 Yeh Bros Cup (Shanghai Bridge Master Championship) started on 8th April. 28 Teams are taking part. The England team includes: Andrew Black (Captain), Gunnar Hallberg, Phil King, Andrew McIntosh, Artur Malinowski and David Bakhshi. There are also English players in the Pharon Team (Paul Hackett, Jason Hackett, Justin Hackett, Brian Senior, Mike Bell and Alex Hydes) and the Allfrey Team (Thomas Paske, Ed Jones, and David Gold). Live coverage of the event will be shown on Bridge Base Online. Good Luck to all involved. 26 pairs from various clubs in the area had a very enjoyable afternoon playing Swiss Pairs at the Club on March 24th. 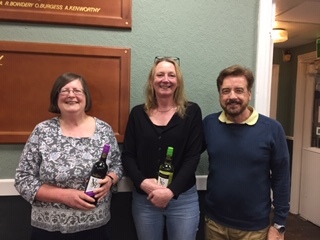 Congratulations to the winners Wendy Burton and Angela Ashleigh, with Susan Bloor and Sue Ralph in second place, only just ahead of third placed Annie Curtis and Jackie Lowrie. Full results can be found on the club websites of Manchester, Larkhill and Altrincham. This weekend saw a rare Bridge mention on the BBC website's sports pages, following one year ban handed to World Number one Bridge Player Geir Helgemo. Congratulations to John Holland, Alan Mould, Jeff Smith and Jackie Pye who have reached the final of the Hubert Phillips with a good win over Heather Dhondy's team. This team has now reached the final in two of the last three years. The annual invitation Lederer Trophy took place on 23-24th February at the RAC club in London. There were many international stars playing in the various teams. Manchester players in the Chairman's team were John Holland, Alan Mould and Gary Hyett with Graham Kirby, Ben Norton and Alex Roberts. For the event web site click here. John Holland has regained the Sunday Telegraph Salver, for the most Master Points earned in the calendar year. John, who has won the competition on six previous occasions, earned 26,361 points in 2018. Gary Hyett, was second with 21,699. John also topped the Gold Point list. EBED Teacher's Course has celebrity guests! The students at the latest EBED Teaching Course at Stretford Bridge Club were surprised to discover two members of the popular quiz show Eggheads were at the club at the same time. 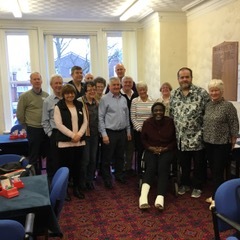 Eleven students from local and far-flung places (two from Guernsey and one from Scotland) were all learning to become EBU bridge teachers under EBU tutor Mike Hickling as well as being fed and watered by Stretford BC Catering Manager Sheila Reynolds. 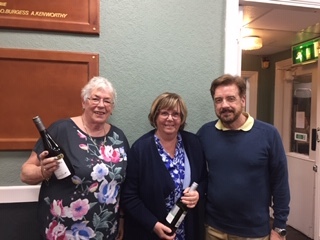 The two TV quizzers: Pat Gibson, currently the top quizzer in the country and the world and Dave ‘Tremendous Knowledge’ Rainford were taking part in the Quizzing Circuit monthly American Grand Prix quiz under the proctorship of Club Secretary Dave Tilley. If you are interested in quizzing and would like to come and try a British or American Grand Prix quiz (held in Warrington on the first or second Saturday), contact Dave at tilsit@btinternet.com. Entry is free for first-timers and many of the popular TV quizzers take part in the local heat from time to time. See if you can spot Irene and Barbara! EBU Membership Campaign Officer Tim Anderson has written a new blog post looking at the how playing bridge with a novice affects your NGS grade. In the blog, Tim addresses the worries of some players that playing with a novice will negatively impact their NGS rating and explains the options clubs have for holding novice sessions. Congratulations to EVE LIGHTHILL on becoming our 2018 Club Champion. This Club Senior Individual Player Contest has been achieved by coming top on Wednesday Evenings over the 12 months period between April 2017 and May 2018. Here at Manchester Bridge Club we can always find you a playing partner but please arrive in good time to allow us to find someone suited to your ability. If you arrive at the last minute you may have to take "pot luck"! Alternatively please phone David ahead of the session to ask him to find someone for you. DO YOU RECEIVE OUR E-MAILS & NEWSLETTER? 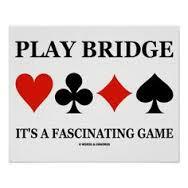 Are you receiving the Bridge Club e-Mails & Newsletter? If not - please let Dave know so he can make sure you are included. If you would prefer not to be contacted please email Dave at the address below. and is less than a mile from Palatine Rd. after just over ½ mile turn left on Wellington Rd. The Club is about 200 yds on the right opposite Withington High School for Girls. right on to Mauldeth Rd West, after just over ½ mile turn left on Wellington Rd. turn left on Mauldeth Rd West and 2nd right after crossing Wilmslow Rd on to Wellington Rd. EITHER take the A34 south and turn right at Mauldeth Rd. West. Take second right on to Wellington Rd. at Hough End Playing Fields. After just over ½ mile turn left on to Wellington Rd. (near Shell petrol station) are the closest. Walk along Granville Rd, turn left on Wellington Rd. The Club is on the left opposite Withington High School for Girls.